legality problems with the post-capitalistic music industry - started a new and wonderful download site offside these ugly scenes to support the public interest in reggae and it´s segments dancehall, dub and roots. The site, who gives progressive reggae musicians a community and a forum, is called "versionist.com" and is really well equipped. Every musician and band, who is involved in dancehall, dub, roots and reggae vocals, can register and get his own subsite, can make his/it´s entries and put own downloads in it. But that's not all: The site offers samples (basses, drums, horns a.o.) for the musicians. The site has it´s own zine, a forum, a chat room and it´s own radio. And, last but not least, thousands of tracks and sketches in here are downloadable for free! But, as opposed to comparable sites, "versionist.com" has truly the spirit of being a community, the spirit of solidarity in their musician´s working for the love and the development of their sounds and visions. All musicians and registered users are asked to give comments to the tracks of their musical brothers and sisters. So you can find beside every track enthusiastic comments, fair advices and ratings, and in the forum and the chat room as well. The most downloaded tracks are recorded in a chart; other listings: artists a-z, brand new and top rated download tracks. Some listed acts are known for own record releases and sampler contributions, but most of the part are amateur-musicians and bands. For them, "versionist.com" is a big help in their musical orientation and development, in getting connected with other musicians of similar or different styles all around the world. Dub-O-Rama leads an interview with the webmaster of 'versionist.com' for getting some background information about this site - to this time I found no article about "versionist.com" in the internet or in German reggae-friendly magazines. Dub-O-Rama: Hello, Mr. Versionist. Can you tell us about the man and the people behind "versionist": Who are you, where do you live? Versionist: I go by the name Versionist on the site. I currently reside in NYC. Dub-O-Rama: How was the idea of "versionist.com" born? could do any better. I bought various music production programs, and churned out about 20 riddims in a month. Some were good, some were not so good. But, I was doing it, and I wondered how many other people were trying to do the same thing. So I decided to try to make a place for this sort of thing. Dub-O-Rama: Dub-O-Rama: What were the difficulties and challenges getting the site started? Who were the people who pushed 'versionist.com' forwards? of its own, and basically runs itself. Dub-O-Rama: How do you get the first projects "on the boat" before starting (mailing? ), and when did you start the site? Versionist: The site was started in January 2002. The first members of the site came as a result of my posting on message boards. I really didn't do much in the form of promotion, because this was just a side project of mine. It has been word of mouth that has really made the site take off. Versionist now serves about 70.000 streams per month, and averages a visitor growth rate of 10% per month. Dub-O-Rama: I think, there have grown many new musician friendships since starting your site, and international connections. Can you tell me an example? Versionist: Well, not any in particular. But there are many collaborations between artists, some of which produced fantastic results. It is one of the great things about the internet, and Versionist takes full advantage. Dub-O-Rama: It seems that dancehall artists are fewer interested on your site as dub- and roots-musicians. Dancehall is more live-oriented; the scene seems, sometimes and partly, a 'lil vain and selfish. Do you agree? Versionist: I agree somewhat, but I do not think that is why there are fewer Dancehall contributions on the site. I think the most prominent members of the site are roots oriented, which makes it seem like it is a roots oriented site. But the site is for everyone that wants to make Reggae, and eventually may become dancehall oriented. It's hard to judge. Dub-O-Rama: Who works on the site, and how is it financed? Versionist: It is primarily financed by myself. I recently included advertisements on the site, which help a little. But, this is a project that costs money, not a money-maker. Dub-O-Rama: Is "versionist" operating from one place or in a network way? Versionist: Versionist resides on a webserver somewhere on the west coast of the United States. Not sure where! Although it originates from the United States, it is only made possible by contributors from all over the world. Dub-O-Rama: Who decides the files for the "artist of the day" and the "riddim of the day"? Is there a system behind these decisions or is it the enthusiasm about a well-discovered entry on your side? Versionist: These are randomly picked on a daily basis, with every song or artist having an equal chance. Even the not-so-good submissions! Dub-O-Rama: Do you know if some artists have grown more successful since being on your site (label contracts, tour partnerships a. o.)? I know, for instance, "Systemfailure" has made a deal with the new label "Dubflash Records"/Berlin. Versionist: I think there is one other artist that has had recent success, but I am not at liberty to comment. But on the most part, members of the site are just happy to be able to have their music heard by a wide audience. Dub-O-Rama: Which are the advantages in login and registration for a normal user? Versionist: Right now there is not too much advantage. But as the site grows, there will be more features that will only be available to registered users, so it can't hurt to reserve your favorite name! Dub-O-Rama: Mr. Versionist, thank you very much! "Just trying to make a mark, not necessarily for myself, but for others. Most people who post here are 14.5 times better than me in terms of production, skill etc. So, this site is for them. Hopefully someone gets to the next level, and has something good to say about this little corner of the web." Dub-O-Rama wishes 'versionist.com' a big standing for the future. Respect for work, engagement and idealism. To all reggae- and dub-fans: Make 'versionist.com' one of your 'favourites'! A Rockabilly´s Nightmare? P.I.L. enthusiastics? Whatever, DUB TRIO from NYC are my youngest personal favourite on this site. 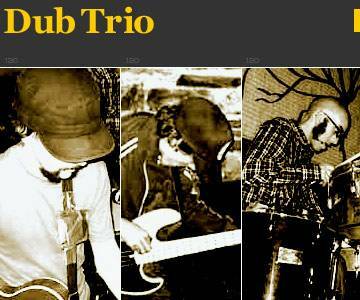 A guitar, bass, drums combo, dubbing live simply but great, and they are spreading lots of energy, spirit and humor. 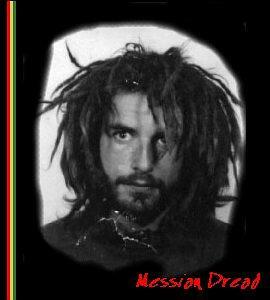 Rastafari-socialist MESSIAN DREAD from the netherlands: a hard working musician, publisher and connector in the international dub scene. For him the internet is no "babylon place" but the chance to connect the international reggae & dub scene in the best and cheapest way. On many internet-places you can find his excellent tunes and comments for free: Also on "versionist.com".